Have you ever been worried over where your kids are? Ever wanted to know where your friends are hanging out? Have you had the need to let family and friends keep track of how close you are to meeting up with them? *Select friend’s pin on map to get a route between your position and theirs and meet up! 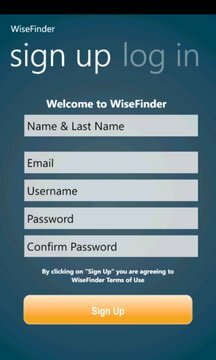 *WiseFinder lets you invite all your friends into your WiseFriends list;invite contacts through SMS, email or through Windows Phone's integrated social networks! *Pin family and friends to Start Screen to launch WiseFinder and immediately find out their position. *Receive toast notifications to get updates on friend requests, accepted invites and position update requests. *Use Live Tiles to see your last cached position from WiseFinder, right from your Start Screen. *Friends and family don’t need a phone to track you. Our website experience (http://mywisefinder.com) lets you do just that with an easy to use interface, as expected of WiseFinder. 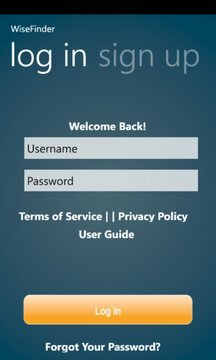 *Best of all, WiseFinder is free!